They do not need the care of man, because they grow spontaneously in parks, meadows, and even in your backyard. They were never cultivated, therefore, are very robust and independent, and, above all, they’re free. Names such as nettle, wild garlic, daisy or dandelion sound familiar, but the matter is complicated when we hear words like chickweed, ground ivy (wild thyme), plantain or “Giersch”. The bitter substances of wild herbs are responsible for a healthy intestinal flora. The high component of flavonoids has an antibacterial effect and protects cells against free radicals. The silica, without which no plant could stay upright – provides both: structure and flexibility. In man, it strengthens bones and the immune system. 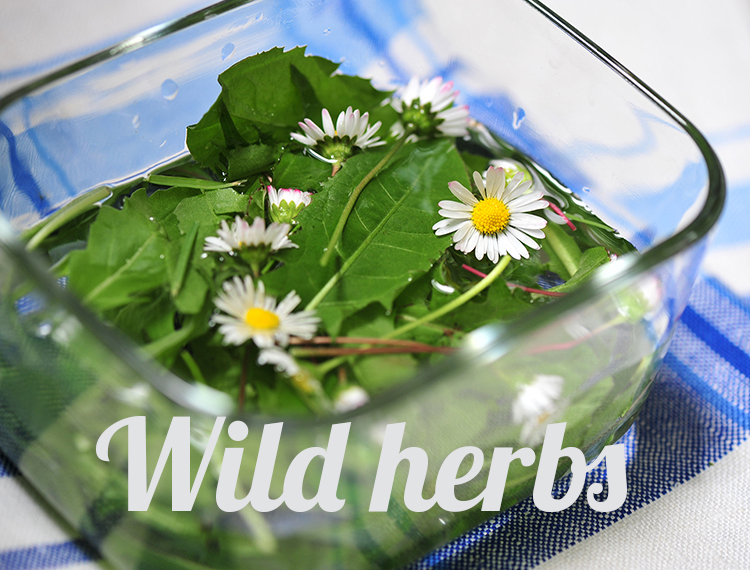 By eating wild herbs, we can take advantage of everything they provide incorporating it for our own protection and survival. Wild herbs are tasty and aromatic, and very usable for all kinds of salads, green “smoothies”, boiled in tortillas, prepared as soups (Nine Herbs soup), prepared as Pesto, and even tea for drinking. DANDELION: is a bitter plant, which stimulates the whole metabolism, activates the functions of the kidneys and gallbladder, provides relief in the case of rheumatism and gout, is purifying and counteracts the formation of gallstones, regulates digestion, and is generally invigorating and restorative. Dandelion, thanks to its composition, is much superior to common lettuce, because it has higher contents in vitamin A and C, calcium, magnesium, iron and protein. As in different countries and regions there is a great diversity of wild herbs, I recommend you go to the field and see what is out there. Surely there are “paths or trails for collecting wild herbs” in your region. Older folks often know much more than we do on the topic! – Ensure that they are fresh: the best option is to pick them yourself. – The best time for gathering is in the early hours of the morning and evening, preferably in forests and remote plains. – They should be washed well in cold water. – There are good books with photos of the Plants, to help you identify them, but it’s better to go the first time with someone who knows them. – Walking through nature looking for wild herbs is a true pleasure, enriching our knowledge, and this will affect our health and independence.